Our Karate Kids Program is designed for children 7 to 11 years old. Your child will learn fundamental skills that will help him throughout his life, such as goal achievement, respect for others, manners, responsibility and focus. Through our home discipline system, schoolteacher progress checks, and other valuable resources, we include parents and teachers so lessons are reinforced in all areas of your child’s life. Our Karate Kids program is especially valuable to those children that do not thrive in the unforgiving world of team sports. In our program, your child is given the time to learn at his own pace and value his own achievements. Each child learns at his own rate and we allow your child to develop as such. We teach your child to view mistakes as input to help him succeed and we allow him to make mistakes without judgment, learn from the mistakes, and continue to work until he succeeds at a task; we teach your child to persevere and overcome obstacles that would stop other children. At Scornavacco Martial Arts Academy, we create an atmosphere of cooperation in which students help each other excel. We teach your child leadership abilities and how to work well in group settings. 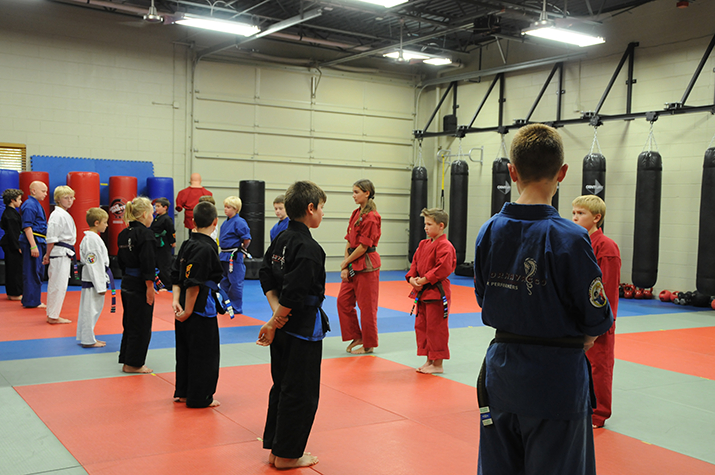 As your child practices self-defense drills with other students he will learn to respect and empathize with others. Of course, your child will learn to defend himself from intimidation and to escape all manner of holds, punches and kicks. In today’s society, children are all too often the target of violence. Whether the threat is from an adult, an older kid, or a peer, our program teaches your child to avoid and escape harm. As your child develops the self-confidence that comes from knowing how to protect himself, he will also learn the value of finding non-violent ways to resolve conflict, and stopping conflict before it begins.